The Learning & Development professional is facing a growing demand for global adaptations of corporate training content. 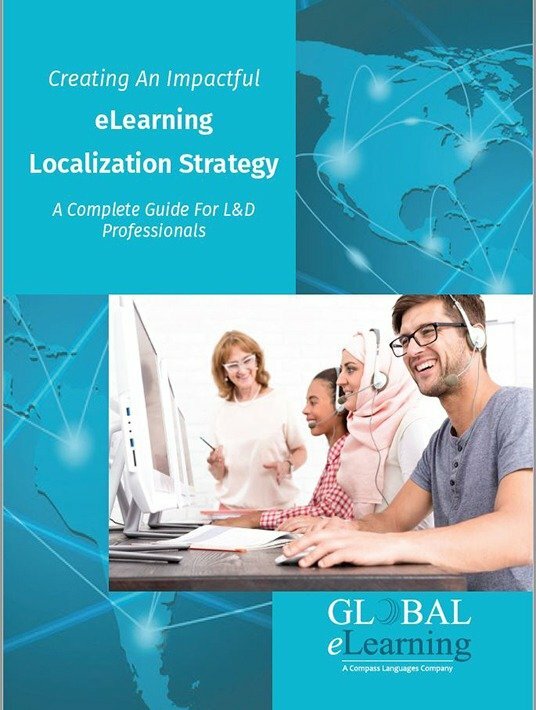 "Localization" is the strategy and process for transforming eLearning content into languages that learners want to study. Within this book are "great" questions regarding ROI, investment costs, schedules, cost drivers, and engagement techniques for successful implementation of localized L&D content. What’s the Difference Between Localization, Translation & Globalization? The ROI of localized eLearning content depends heavily upon the engagement of the end user who happens to live/work in continents that probably are very different than that of the content creators. Everyone knows that nothing goes above learning in your native language. Once content has been "localized" to your native language you comprehend the text better as a whole. This immediately incites you to participate, be proactive and really partake in the learning process. It can remove any form of passivity. Localizing training content has also proven to accelerate productivity, reduce lost time, mitigate injury claims and improve employee retention. Win-Win for everyone. After checking the stats on efficacy, it comes down to the application. In order for the implementation to be impactful, Global eLearning offers some incredible perspective and is a great place to start.